One could say that spirituality is the belief in a supernatural entity or consciousness, and then codifies a set of ethics based on values such as compassion, love, integrity, and selfless service. Spirituality addresses issues of the relationship between oneself and the godhead whereas ethics is a code that describes principles, intentions and conduct between oneself and other humans. 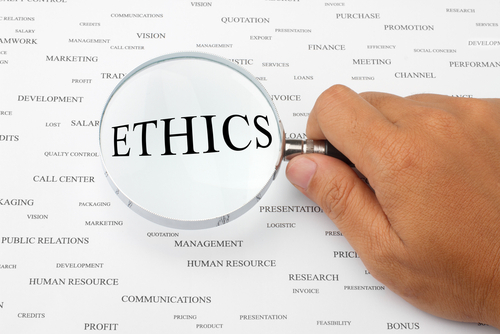 We see ethics being expressed in context such as business ethics, medical ethics, and personal ethics. Ethics are often centred around values and value systems such as truth, integrity, freedom, service, rights, responsibilities, and sacrifice of the personal good for the common good. This implies both boundaries and constraints for the individual who would align to, and be governed by such an ethical code. We each need both a personal code of ethics plus a knowledge of the code of ethics that applies when we join a group or community or organisation. These will not always be in alignment and indeed part of our joining a group will be based on how different our ethics and values are from those of any group or organisation or community we are considering joining. Psychological studies have shown that people with a personal code of ethics and values are consistently happier, healthier and rate their life as having meaning and purpose, than those people who lack such internal frameworks within themself. Organisations are also considered to have healthier cultures when a solid ethical base is lived out within its workforce. In the context of groups such as businesses or organisations, ethics are a universal consideration and binding principle that every person in that group must fall under for that ethical structure to work and more importantly, to be seen to work. In recent times we have seen a glaring example of how FIFA, the global soccer organisation has been the subject of wide ranging allegations of behaviour that corrupt the principles of ethics and ethical conduct. By its conduct FIFA has undermined its own integrity and reputation in the minds of billions of people. FIFA has rendered its ethical codes impotent either by making their ethical code only subject to some employees, and in another setting to have the compromised leaders sit in judgement of themselves and their own once challenged with allegations of unethical conduct. FIFA is awash with ongoing allegations and corruption and “bought” votes and “bought” World Cup hosting by member countries. FIFA is a large organisation that deals with large amounts of money. FIFA earned at least 1.6 billion dollars in sponsorship fees alone between 2006 and 2010 which makes transparency a key need for such a body which awards lucrative soccer events based on a voting process. Australia reportedly just spent nearly $50 million in a failed attempt to win the right to host the 2022 World Cup which was won by little known Qatar. Australia only got 1 vote and was embarrassingly bundled out in the first round of voting despite lobbying “proving” it should have been a finalist. A wave of allegations has since emerged regarding the corruption in the bidding process of vote buying, delegate corruption, and rigging of processes. For example it has emerged via a leaked email that Qatar considered bailing out the debt-ridden Argentine football league to win support for its controversial bid to win the 2022 World Cup. They targeted Julio Grondona, the powerful FIFA Vice-President, who hails from Argentina, and who influences and votes in the 24 executive group who awards the World Cup. His own football league is embarrassingly broke and owes their tax authorities nearly 79 million dollars, plus has multi-milllion dollar requests from member clubs who need new uniforms, equipment and funding. The strategy would have been to bail out the debt and gain Qatar influence and returned favours. Interestingly FIFA’s Secretary-General was caught out releasing an email saying Qatar had “bought the World Cup”. Grondona who has the nickname “The Godfather”, admitted he voted for the Qatar 2022 bid for the World Cup. FIFA surprisingly do have an ethics committee, which European press allege Sepp Blatter is part of. This committee saw it just and right to suspend both Mr Jack Warner and Mr Mohammed Bin Hammam, who were election competitors of Sepp Blatter. However it has been silent in the face of calls from member governments and professional football bodies such as the English FA to suspend Sepp Blatter for his own alleged misconduct, as well as poor leadership and governance of FIFA, and to suspend the election process for a new FIFA leader. The FIFA president Sepp Blatter has just defied his critics by ramming through an election process which saw his challengers sidelined by corruption charges, and he reinstated despite having overseen FIFA when the alleged corrupt previous decade of paid off FIFA officials, paid for votes, and money and gift trails being uncovered to key voting delegates occurred. Once the election process was completed then the “Family” as Sepp Blatter referred to as being the member nations of FIFA, then turned on the “Whistle Blower” member, British FA. This mirrors the actions of a cult where members turn on and abuse any “unfaithful” member who would challenge the leader and the group belief system. The act of attacking the Whistleblower then binds the rest of the group closer to the leader and the belief system out of fear as they then want to further prove their loyalty lest they are the next scapegoat. This then binds them to a culture of favour and return favour that they learn cannot be challenged. In the last 2 election processes the Sepp Blatter election sell for his campaign was that he would “clean up” the FIFA world body. This claim for a new era of “zero tolerance” has so far appeared to be directed against critics rather than corruption. His claims appear hollow given recent and consistent allegations surfacing that refuse to go away. International anti-corruption body, Transparency International, had called for the election process to be suspended whilst the serious corruption charges were investigated. They noted the conflicts of interest in the way governance at FIFA had been seen to occur. The election occurred anyway. Ethical principles and altruism developed as people in groups and communities learnt and recognised that they must care for each other if the group or community was to grow and prosper. Unfortunately they also learnt that certain members had only a concern for their own selfish gain at the expense to the other members of the group and community, and any healthy group needs ethics and rules to bring accountability, restraint, and consequences to those who would act for self interest when that hurts the wider group or community interest. FIFA has shown a blatant disregard for the concerns of its own members, its sponsors, and governments and football bodies around the world. This approach may preserve the immediate hierarchy from scrutiny, but it will create cynicism and distrust that will invariably last for years. The key lesson here is that transparency and abiding by an ethical code of conduct will prevent a crisis of confidence arising where the truth is a casualty to the politics of being right. Most people will now sneer at world soccer and the mention of FIFA. FIFA has kicked an own goal but is blind to this reality. Stay well everyone.